The Food Standards Agency (FSA) in the United Kingdom has launched a campaign this month calling people to ‘Go for Gold’. A reference to the advice that when frying, baking, toasting, or roasting starchy foods like potatoes, you should aim for a golden yellow colour (or lighter). Acrylamide is a chemical that is created when many foods, particularly starchy foods like potatoes and bread, are cooked for long periods at high temperatures, such as when baking, frying, grilling, toasting, and roasting. The scientific consensus is that acrylamide has the potential to cause cancer in humans. These findings are not exclusive to the UK. The US Environmental Protection Agency has declared acrylamide to “likely to be carcinogenic to humans” and the International Agency for Research on Cancer (IARC), part of the World Health Organisation, says it is a “probable human carcinogen”. My experience studying natural health for over 10 years has taught me that whetever we get official messages of this sort, whether they come from the FSA in the UK, FDA in the USA, or the World Health Organization, the truth behind the health risk is actually much worse. As a promoter of a raw food diet, I knew of the risks of cooking and cancer. Many states across the US have already passed laws making it illegal to cook complex carbohydrates without posting a warning notice to patrons about the dangers of acrylamide. 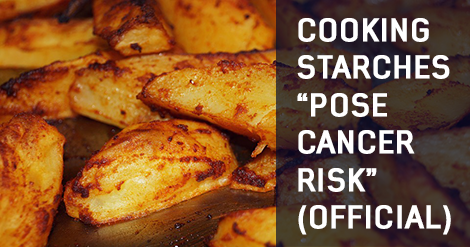 The risk of getting cancer from cooking is not limited to only starches. Research has shown that eating too much processed meat and red meat can increase the risk of developing cancer – that is a definite. Cooking meat at high temperatures, such as grilling or barbecuing, can produce cancer-causing chemicals called, heterocyclic amines (HCAs) and polycyclic amines (PCAs). 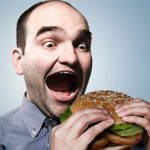 If we sum up all these risks associated with the practice of cooking, we come to a certain conclusion that eating cooked food doesn’t have much going for it, does it? If we also add the fact that we are destroying our planet because of our erroneous eating habits, it doesn’t take much of a genius to figure out that the staple human diet should consist of eating seasonal raw fruits and vegetables. Should you eat starchy foods? If you’ve been following me long enough, you know I don’t consider eating cooked starches to be a healthy practice, and I only recommend eating them as a transition food to a eating a 100 % raw diet. If you want to eat cooked starches, however, it’s always better to steam them. Eating starchy vegetables in their raw state, such raw sweet potato, raw pumpkin, and other such vegetables – if prepared correctly – can be an enjoyable experience. I think the Acrylamide threat is real and you should adopt all necessary measures to reduce the levels of exposure. Or as the BBC report would put it: Are they trying to take all the fun out of life? 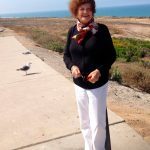 Well, I have to tell you that the real “fun” for me during the period of which I restored my health and moved to a raw food diet has been characterized by the “removing” of things from my diet and not by adding stuff. You will free yourself from disease when you take all the crap out of your system; that’s the reality. 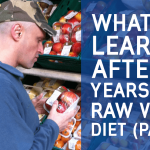 I can understand that the idea of eating a 100% raw may be a difficult concept to grasp for some people. But adding more raw food into your diet in such a way that you’d enjoy and it would make you healthier is definitely the way forward. Information that’s not true??? See source links. I, personally, am glad to see you take a more “extreme” approach. Of course, the same idea that a human must eat cooked food is the real extreme. I feel more people, especially me, should be more out spoken about what they think is right. I applaud you for your efforts to get the true word out there on benefits of a raw food eating plan. 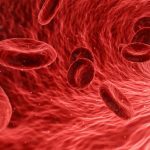 In February 2017 I was diagnosed with prostate cancer which had metastasized to other areas. It was in stage 4. I changed to a plant based (about 85% raw) eating plan. I do as much organic as possible. No chemo, no radiation at all. In October 2017 the cancer had been pushed back, and still is, to a non detectable level. I am a believer in raw food based diets. I enjoy your posts. Keep up the good work! I too love the raw lifestyle. Am probably around 90-95% raw, mostly fruit and keep my nutrition fairly basic. Am looking to maybe add some raw recipes in the future though. I personally thing that the starch link to cancer is more than likely from the oils they are cooked in. Just my 2p worth and do enjoy reading your blog posts.